A journey on the Venice Simplon Orient Express is a truly unique and memorable experience. As one of the world’s most famous trains, the Venice Simplon Orient Express made its maiden journey from Paris to Istanbul in 1883 and has since been the pinnacle of luxury rail travel and synonymous with the style and sophistication of a bygone era. The Venice Simplon Orient Express, and original Orient Express train that came before, have always been the luxurious transport of choice for the social elite, not to mention actors, spies, stars of stage and screen, and of course, Agatha Christie’s famous detective, Hercule Poirot. Perhaps because the Venice Simplon Orient Express has such a colourful and vibrant past, and certainly in part as a result of the meticulous attention to authentic detail during the restoration process, there can be no more memorable an experience than seeing the train in person for the first time. Whether boarding the exquisite British Pullman (the luxurious train that takes you from London to Folkestone as you start your Venice Simplon Orient Express adventure) at London’s Victoria Station or in Calais, Paris or Venice getting your first glimpse of the impeccably blue and gold carriages of the Continental Wagons-Lit, you’re certain to forever savour that first glimpse of such a unique piece of rail travel history. The moment you step aboard the original Venice Simplon Orient Express Continental Wagons-Lit carriages, you step straight into a bygone era of elegance and luxurious sophistication. The preservation of this luxury experience brought to the modern day is truly unrivalled and it is a real privilege to enjoy the charm and quality of a journey taken aboard the Venice Simplon Orient Express. This enchantment instantly relaxes the fortunate traveller and draws them into the seduction of the journey. It is truly refreshing to embrace the journey itself, rather than the speed or efficiency of getting from A to B, as is so often the case in modern day train travel. 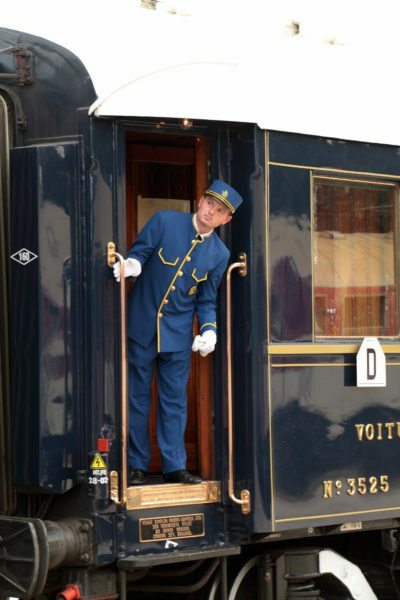 The Venice Simplon Orient Express, as a unique railway experience, cannot be emphasised enough, even down to the smallest detail. 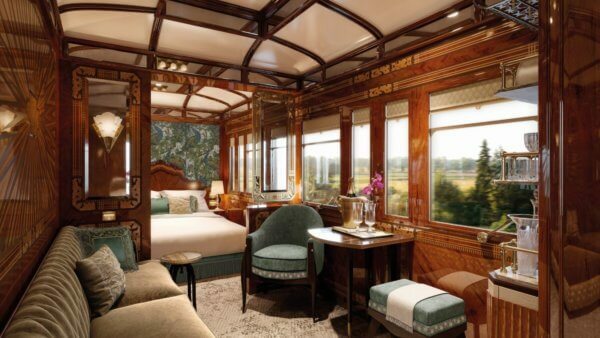 Made up of original 1920s and 30s European carriages, faithfully restored to their original elegance and grandeur in every respect, the Venice Simplon Orient Express has an abundance of intricate workmanship to enjoy during your journey, whatever its length. Distinctly art deco, the carriages boast exquisite marquetry panels and designs by artists including René Lalique. As a traveller aboard the Venice Simplon Orient Express, you’ll enjoy your own private compartment, and flawless attendance by Cabin Stewards throughout your journey. The staff of the Venice Simplon Orient Express pride themselves on their service and travellers are assured of the perfect balance of attentive yet discreet levels of service. Within each compartment aboard the Venice Simplon Orient Express you’ll benefit from an authentic and original washbasin and cabinet with hot and cold water. Whilst you dine in the evening, your compartment is transformed into a comfortable bedroom, complete with luxurious towels and impeccably crisp linen. Though not technically authentic, and as a small break from tradition, but very much in the interests of luxury, comfort and exclusive travel, 2017 has seen all compartments and public areas aboard the Venice Simplon Orient Express fitted with air-conditioning. Designed for comfortable, luxurious train travel, your Venice Simplon Orient Express cabin is a cosy lounge with a large sofa, a footstool and a small fold-out table during the day. Discreetly concealed in its own cabinet is a washbasin with hot and cold water, together with towels. Your cabin is transformed, whilst you enjoy dinner in one of the dining cars, by your cabin steward. 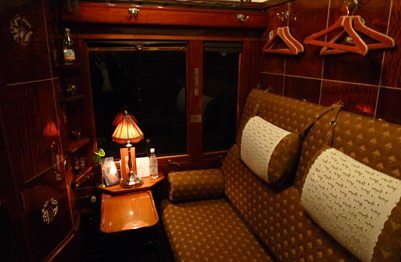 Upon your return from after-dinner drinks in the bar car, you’ll find your daytime seating layout has been cleverly converted into upper and lower sleeping berths complete with the highest quality linen. Further, deep, sumptuous bathrobes, slippers and additional amenities by Temple Spa are available for your exclusive enjoyment. If you’re looking for additional comfort and space, you may prefer the option of a cabin suite. Venice Simplon Orient Express cabin suites are made up of two inter-connecting twin cabins, and are certainly a recommended upgrade. With the flexibility of both cabins, you can choose to have your cabin set up in lounge format, whilst the other acts as bedroom with upper and lower berth, or alternatively opt for two lower berths, one in each inter-connecting cabin. Each Grand Suite comprises a double / twin bedroom, a substantial living area and room for private dining and a sofa. The sofa in the lounge area can be converted into an additional bed in the evening. Exclusively for Orient Express accommodation, each Grand Suite boasts a private en-suite bathroom. These include shower, washbasin and toilet, plus bespoke amenities and complimentary designer bathrobes and slippers for your enjoyment. Free-flowing champagne and the option for private dining complete this luxury experience. Never before have the service and the setting been so exquisitely matched. Beginning your journey, relax in your cabin and watch Europe’s vistas glide by with a smoothness and elegance only train travel can achieve. Your personal steward will greet you on arrival and will show you to your cabin gleaming with polished brass, inlaid wood, vibrant white linen and luxurious towels. They will show you how everything works and how to call for assistance, where required, during your journey. Your comfortable compartment provides a restful, calm space to relax, offering panoramic views to enjoy as the landscape slips by. A number of passengers choose to leave their cabin doors open during the day when traveling aboard the Venice Simplon Orient Express. This leads to a pleasant community atmosphere on board where conversations are sparked with other passengers and scenery can be enjoyed from both sides of the carriages. As the afternoon progresses, tea with cakes and pastries is served in your cabin by your cabin steward, a light refreshment and bite to eat before preparing for dinner, which is a centre-point for any Orient Express journey. Dressing for the occasion is an integral part of the Orient Express experience, and it is almost unheard of to be ‘overdressed’ for dinner. Tuxedo, cocktail dress, bow ties and fascinators are all part of the indulgence of dinner aboard the Orient Express – an event to be lavishly enjoyed by all. Once dressed in your finery, the tone of the evening is set with a visit to the Bar Car or Champagne Bar, where exquisite champagne or delicious cocktails and a welcoming atmosphere are in abundance. We’d suggest asking for a “Guilty 12“, a cocktail created by Walter, the bar man, containing 12 mystery ingredients and inspired by the novel “Murder on the Orient Express”. It perfectly captures the mystique of this unique rail experience. To give a taste of the level of exclusivity, previous travellers include royalty, heads of state and celebrities such as Gregory Peck, Alan Whicker and Cher. It is truly a unique, intimate and stylish experience. Enjoy a few pre-dinner cocktails or a glass of fizz here whilst mingling with fellow travellers and soak in the atmosphere of this once-in-a-lifetime experience. Once you have made the most of the Bar Car or Champagne Bar, it’s time for you to move on to one of the three beautifully restored 1920s art deco restaurant cars – L’ Oriental decorated in black lacquer, Etoile du Nord with its beautiful marquetry, and Côte d’Azur, boasting stunning Lalique glass panels. Sympathetic and soft lighting enhances the ambience while flawless linen, French silverware and heavy crystal invite you to prepare for a dining experience to remember. At dinner the attention to detail is simply breath-taking. The sum of the parts; linen, silverware, the crystal glassware, are all alluring elements of the experience and meet with exquisite food to create an overall result that is a beguiling evocation of the golden age of travel. Thanks to the quality and style on offer, it in no way feels antiquated or dated, the whole experience transcends the 1920s era and boasts a completely fresh and contemporary indulgence – on a par with any of the finest restaurants in London or Paris. At this level, luxury is timeless. The food served during dinner on board is an unforgettable and unique delight. All dishes are freshly prepared on board by French chefs, with the finest ingredients taken on board during the train’s journey. All meals, brunch, lunch and dinner, are served in one of the three aforementioned restaurant cars with service provided by attentive waiters. For exclusive privacy, breakfast and afternoon tea are served in your compartment by your cabin steward. The train famously visits some of Europe’s most evocative destinations. The traditional route between London, Paris and Venice (or vice versa) is now supported by additional departures from Venice to the luxury and mystique of Vienna, Prague and Budapest as well as an annual journey from London to Berlin and back. For a true taste of trans-continental luxury travel, the Venice Simplon Orient Express also offers an annual, very special departure to Istanbul, re-creating the original journey of 1883 on this six-day adventure. Enjoy the unparalleled luxury of the rolling-stock, and the finest quality of service, amid some of the most beautiful scenery in Europe on board this beautiful and one-of-a kind luxury train. A selection of journeys are available and the beauty of the Orient Express is that it can be taken as much as an adventure into luxury on its own or as a part of a wider European holiday. Choose to travel on the train both to and from Venice for example, or enjoy a holiday that incorporates visits to exciting cities, such as Venice, Paris, Vienna, Prague, Budapest, Istanbul and recently introduced Berlin, with the Orient Express forming one exciting leg of your journey. Whatever your destination or holiday plans, you can be sure of unique and exquisite service of world-class standards, a veritable feast of sumptuous menus and a nostalgic reminder of a time when the journey took precedence over the destination. For up to date travel advice from the Foreign & Commonwealth Office including security and local laws, plus passport and visa information, check gov.uk foreign travel advice. Please Note: A journey on board the Venice Simplon Orient Express may not be suitable or ideal for everyone – a journey aboard the Orient Express is ideally tailored to those who yearn for the unique experience of a bygone era. For example, the carriages are the original 1920 – 1930s rolling stock and, although they have been beautifully restored and regularly maintained, they have specifically received very few modernisations. If travelling during the cooler months, you will be likely to see your steward shovelling coal into the authentic coal boiler in each carriage in order to heat the radiator in your cabin. Remember these carriages were built in an era when travelling across Europe and sleeping on a train were a luxury in themselves. Passengers should note that the compartments are relatively small and do not have private facilities, other than a wash-basin, except for the Grand Suites. However, please note that as of 2017, all cabins and public areas on the train are now air-conditioned. There are toilet facilities at each end of the carriage – again as a direct result of the preservation of the heritage of the rolling stock. Be aware that there are no laundry facilities on board the train.